Mr. Putin must feel pretty good after signing that $400 billion natural gas deal. With a massive cash infusion such as that over a predictable schedule, Putin’s Russia is in much better shape today than ever since the fall of the Soviet Union. Crimea has been annexed, peacefully; Georgia and Ukraine blocked from both NATO and EU membership for the foreseeable future; America bogged down by debt, war-weariness, and an increasingly dysfunctional political system. Been a damned good couple of years for the man. But invariably, America will reorganize itself and counterattack. So to secure all the gains made, to prevent America from finishing the job started in 1991 and preserve what remains of Russia’s independence as a great power, he must now seek out an alliance structure that permanently reshapes the world’s geopolitical landscape. His Eurasian Union won’t cut it; too many nutjobs and backwards weird-o states in the rolls. With Europe now lost to America, where can he now turn? The obvious answer is China. Danger, America! Never let anyone control the Heartland! Halord Mackinder was an English geographer who first wrote about the Heartland – essentially, the heart of Eurasia – as the geographical pivot point from which any single power could then go on to dominate the world. Alas, he was wrong. First Russia and then the Soviet Union did control that Heartland and still failed to win the world. That was because while the Heartland does have plenty of resources, people, and territory to set up a mighty state, it lacks the ports necessary to transport that stuff around to bring the real hurt to enemy forces. During the Cold War, a key part of American strategy was to prevent the Soviets from expanding into places where they might gain easy access to the Atlantic and/or Pacific Oceans. The loss of China in 1949 to Communism was such a blow for this reason; its split from the Soviet bloc in the 1960s was equally as disastrous for Moscow. From enemies to allies to enemies back to allies? Imperial China and Czarist Russia were not the best of friends, competing for power in Siberia and the Russian Far East. But that changed for a time under the early Chinese Communists, who needed Soviet industrial goods to modernize their state. When America stepped in as a superior trade partner, the Chinese jumped ship. 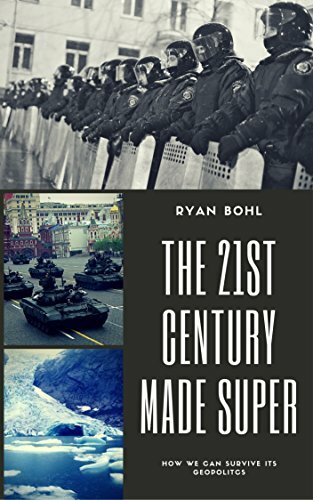 After the fall of the Soviet Union, relations were normalized as both states reorganized themselves into the authoritarian capitalist states they’ve grown into. Now they’ve noticed they’ve got quite a lot in common. Such a thing must chill the blood of the U.S. government. The Shanghai Cooperation Organization, the building blocks of what would become a serious Chinese-Russian military alliance. Trading partners today, great allies tomorrow? Both Russia and China tried communism and decided it wasn’t for them (with varying degrees of order as they made the switch). Both have nasty post-communist hangovers in the form of state-owned enterprises that don’t perform as well as they should. Both are built on the borders of old imperial states and have a lot of ethnic groups that clamor for autonomy or independence. And both don’t particularly like the American-led world order, because said world order means the elites in Moscow and Beijing must play by rules that would likely fray their borders. (For example, national self-determination, an oft-America-supported principal could cost Russia Chechnya and other Muslim-majority territories, while China might lose Tibet, Outer Mongolia, and Uighurstan). Russia doesn’t have enough people to work its many Siberian resources. China lacks the resources but has the people. It’s a simple enough trade. But around it grow more and more connections and shared interests that make a Russian-Chinese alliance all the more possible. A key shared interest is getting America to shut the hell up and step back away from authoritarian governments butchering rebellions. For both, the precedent of Libya was disastrous; there, a dictator, faced with armed rebellion, was overthrown by a coalition simply because he was acting morally reprehensible. But to authoritarian leaders, such actions make a great deal of sense – when people don’t agree with you, you simply sack, arrest, or kill them and replace them with people who do. If coalitions against morally bankrupt regimes become a regular thing, the eventual targets will be China and Russia, both of whom must do bad things to keep their restive ethnic minorities, as well as dissident movements, under wraps. Syria is the front line in this confrontation. For now, Russia and China have been content to wield their UN vetoes to protect a government they gain nothing from except the halting of a world whereby bad men who do bad things get killed for those bad things. Russia and China’s borders are not entirely ethnically based, and if one follows the principal that each ethnic group that wants a state should get one, both of them should be a great deal smaller. Not precisely ideal for elites who like power. Now that’s just about the cutest potentially world-dominating logo ever made. Confrontation with Russia or China will push either into the other’s arms. Such an alliance would give China access to Russia’s resource base that would allow it to militarize all the faster. Russia, in turn, would get access to China’s people to boost its own economy, as well as the necessary ports in the Pacific to trade and to build mighty fleets. So while the U.S. would like to deal with Syria, save Ukraine, and stop Iran’s nuclear program, it cannot push too hard on these issues lest it alarm either Russia or China and accidentally cause a real military alliance to come into being. Russia and China are natural rivals rather than partners. Their long, shared border is tenuous; a real problem is that Siberia is empty of Russians and China has too many Chinese. Why shouldn’t Chinese move north, anyway, if there’s work to be done and forests to be felled? What unites them is a common dislike for American hegemony. If that hegemony is tolerable, their own differences will keep them at arm’s length. Any American president who acts too aggressively in pursuit of U.S. interests will cause such an alliance to come into being. It was Nixon’s withdrawal from Vietnam that helped spur Mao to switch camps; it was Truman’s entry into the Korean War that cemented Mao in Stalin’s. The past can be instructive; let’s hope someone in D.C. has read their history. Pingback: New American Century, bye, bye….. | Food for Thought.